New Armory Album – Empyrean Realms – Out 11/12/13! Great news! 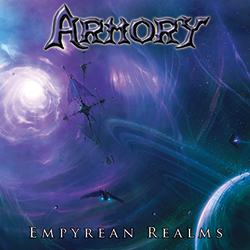 Armory’s long expected and highly anticipated second album, Empyrean Realms, is officially released as of November 12, 2013. The album is being released and promoted worldwide through Armory member Joe Kurland’s newly created label, Metavania Music. Empyrean Realms contains nine original songs and was once again engineered, mixed, mastered, and produced by the band themselves at Mystic Star Studios and Damage Studios, both based in Massachusetts, USA. The 12-page album booklet contains celestial artwork produced by England’s Gary Tonge. We believe Empyrean Realms is a huge step forward for the band and an album which displays a style and sound which is more uniquely our own than ever before. Compared to our debut album, The Dawn of Enlightenment, Empyrean Realms has more dynamic composing and arranging, with more colorful melodies, head-banging riffs, key changes, and progressive elements. The lyrics are also more articulate, centering on the themes of metaphysics, cosmology, and the power of human will. If you like your metal with soaring vocals, crunchy guitar riffs, blazing solos, technical drums, finger-picked bass, flavorful key changes, and an epic atmosphere, then Empyrean Realms was made for YOU! We have made a sampler video for Empyrean Realms to give fans a preview of what the new Armory album has to offer. Check out the new website to learn more about Empyrean Realms. As part of the website we also have a much improved Official Armory Store, with more options and better functionality. And it’s the ONLY place you can get Armory album shirts, posters, and stickers. Get your copy of Empyrean Realms (physically or digitally), the album shirt, or the ER Fan Pack today! Armory would like to personally thank all our fans near and far and throughout the years who have enjoyed our debut album and waited so patiently for the release of our second album. We are thrilled to finally unveil Empyrean Realms and hope fans agree it was worth the wait. At this point we now intend to be much more interactive with our fans so like us on Facebook, follow us on Twitter, play us on YouTube, visit our new Website, sign up to our Newsletter, and send us your comments and critiques!